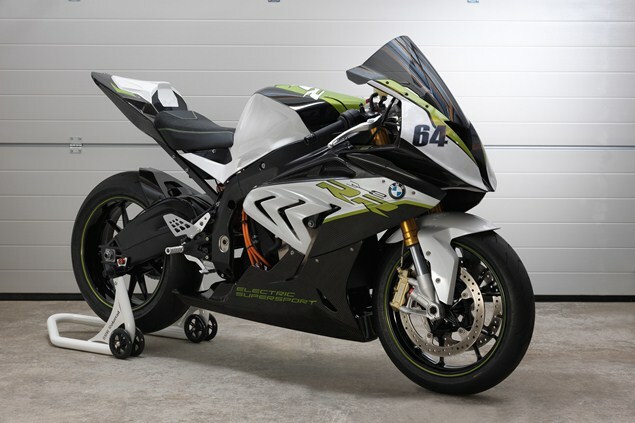 HERE'S BMW's just-unveiled electric superbike using the chassis of an S1000RR. Called the eRR, it's been created to unite the high-speed performance of the S1000RR with the apparently even better 0-30mph acceleration of BMW's electric scooter, the C evolution. BMW Motorrad head Stephan Schaller said the S1000RR was 'setting standards' in sport for acceleration, top speed and handling, adding: 'However, if acceleration on the first metres, up to 50 [or] 60kph, is the point, the RR’s 199hp have to admit defeat by another BMW product: the C evolution with its electric drive.